ofcourse… it is nothing but a bad scripted reality show!! I watched this twice and still don’t get how Google and Facebook spying on their users for the NSA had anything to do with market rigging. The guest simply claims a connection without evidence. 1. Booz-Allen does business with Libor and other financial matters. 2. Snowden employed by B-A. 3. Some of his released documentation is of this type. 4. The financial angle is the one that really bothers the federales and banksters. 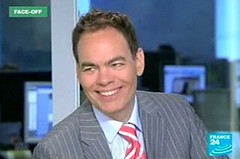 nonsense… it is obvious that Keiser is speaking much more knowledgeably than any others. Of course, when you have organizations like the CIA, NSA, ad nausea, they clearly have access to all of the data.. which of course, they are going to use for the financial gain of their owners (the ‘elites’), which, of course, is consistent with the long history of the Crown’s financial control of America, beginning with George Washington’s Central Bank… owned by the ‘foreign financial interests. and soo so much more..
Its a band wagon of fools who want to have a say and just makes the truth looks even more stupid. Its all a theory and it is of the mind without backing evidence of a smoking gun and without finger prints being presented, its the same as Darwinism has been portrayed but is still only a theory without the so called evidence being proven correct. If people cant understand the truth, to which they don’t, this world is for the taking, put a human in amongst monkeys the human will rule, teach the humans to believe there no better than monkeys and no reason for anything, and everything came from nothing, then people will believe anything or discount it and can be ruled over by ones who know the truth. Logic rules, and the illogical ignorant live in chaos. Divide and conquer all, Silly humans with a ring in there nose, an iphone in the ear and a laptop in front of them to be lead down the garden path all because their intelligence is lacking the understanding of all that is presented to them without wisdom being obtained from knowing what is truth and untruth and by fools teaching fools to create even more fools. A world dead in the dust of others memories and teachings that came before them to light the way for others to follow, but the darkness has claimed most, and of the light of truth for only a few are now left. Man makes hell in his imagination look tame as man makes hell a reality for most to live in. A child born into the world learns to trust, and as an adult in the world they have learnt to untrust, so what does this say about the world and people in general. We live in a terminally ill world, and we wait for a curer, or death. So what would I know as there seems to be many more people think they know the truth, but in reality liars prosper these days than the truth, or am I a fool like the rest of you. Max Keiser puts an interesting twist on this story and it makes perfect sense. NSA – what a tool for insider trading, here and in the world! Interesting?